Leave it to Jedidah Isler to make an astronomical impact. Founded in 1984, TED (Technology, Entertainment, Design) is a global series of conferences on scientific, cultural and academic themes. Isler earned the fellowship in recognition of her pioneering study of blazars—supermassive black holes found within large galaxies. She is equally known for her tireless advocacy of inclusion and empowerment across racial and gender lines in the STEM (science, technology, engineering, mathematics) disciplines. It’s with this background in mind that Isler will take the international stage in Vancouver. Not only will she deliver a “TED Talk” about her research, but she will also soak up other lectures, tech demos, art exhibits and stage performances that have made the TED the intellectual juggernaut that it is. The TED announcement marks the culmination of a busy few months for Isler, who also is a visiting research fellow at the Harvard-Smithsonian Center for Astrophysics in Cambridge, Mass. In October, she traveled to her alma mater, Yale University, to deliver the keynote address at the 45th anniversary of the Afro-American Cultural Center. The weekend-long program, titled “Inspiring Global Leadership in the 21st Century,” featured an array of guest speakers, including other prominent intellectuals, industry leaders and emerging talent. 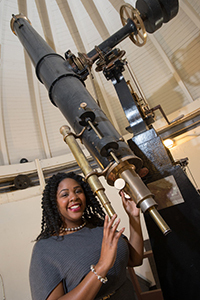 The invitation was fitting for Isler, who is the first African American woman to have earned a Ph.D. in astronomy from Yale. Isler has been interested in astronomy since she was 12. Following undergraduate studies at Norfolk State University in Virginia, she attended Fisk University in Nashville, Tenn., where she earned a master’s degree in physics and participated in the then-nascent Fisk-Vanderbilt Master’s-to-Ph.D. Bridge Program. Only Isler ended up going to Yale. Since joining Syracuse’s physics department, Isler has expanded her work to include a study of the inner workings of black hole environments. She also has worked alongside the Gravitational Wave Group, which is part of the LIGO Scientific Collaboration, an international experiment studying collisions of highly dense neutron stars. This past fall, she traveled to Ecuador’s Galapagos Islands to address the International Astronomical Union’s symposium on extragalactic jets. A woman in a male-dominated profession, Isler understands the broader significance of her work.